million expansion that included a tobacco storage facility. Starting in July, Southern Virginia farmers will be able to bring their tobacco directly to JTI Leaf Services’ new buying station in Danville. “Our new onsite location gives us further interaction with growers and cuts back on costs,” says Ward Anderson, the company’s manager of corporate affairs and communications. In the past, growers have delivered their tobacco crops to other receiving stations in Virginia, Tennessee, Kentucky and North Carolina. “We will still offer that for growers out of the area, but those in the area can deliver directly to us now,” says Anderson. The buying station represents the second phase of a $7 million expansion announced by the company last December. 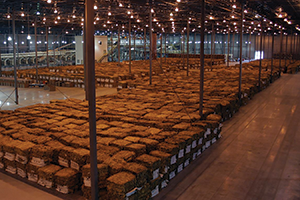 During the first phase, JTI Leaf Services added a 106,000-square-foot storage facility for raw and processed tobacco. The company’s 75-acre campus also includes an administrative building and a processing facility. “The new onsite station is being built as an extension of a currently unused part of our facility,” Anderson says. JTI Leaf Services was established seven years ago in Danville to procure and process leaf tobacco for Japan Tobacco International, which is based in Geneva, Switzerland. (JTI’s parent company is Tokyo-based Japan Tobacco.) The Danville operation is JTI’s first tobacco processing facility in the U.S. Since arriving in Danville, the company’s local investments have totaled $70 million. The new storage facility is expected to improve efficiency and cut costs, helping the company become more competitive. “We are very active in the global market,” Anderson says. To help with the expansion, the company will receive an industrial enhancement grant from Danville based on meeting investment targets for taxable property. Located in an enterprise zone district, the company also will qualify for additional state and local incentives.